Acid Regulator™ adjusts pH to the acidic range (4.5–5.5) and softens water by precipitating calcium and magnesium. Acid Regulator™ supports the establishment of the optimal environment for all acid acclimated species (e.g. neons and other tetras, etc.). For further freshwater environment enhancement, use Fresh Trace™ to restore the proper level of trace elements and feed NutriDiet® Tropical Flakes for thriving, healthy freshwater community fish. Contains phosphate buffers and conditioning agents. Safe for all freshwater fish acclimated to acid pH. Use 1 level teaspoon (5 g) for every 40 L (10 US gallons) daily until intended pH is reached. For precise dosing use the Seachem Digital Spoon Scale. Thereafter, use once a month or with water changes as required to maintain pH. To raise pH, use Neutral Regulator®. To target a particular pH use in combination with Neutral Regulator® following the chart. This chart assumes the use of unbuffered water (RO or DI). If water is already buffered use the chart as a starting guide. Use Prime® to dechlorinate tap water before doing a water change. 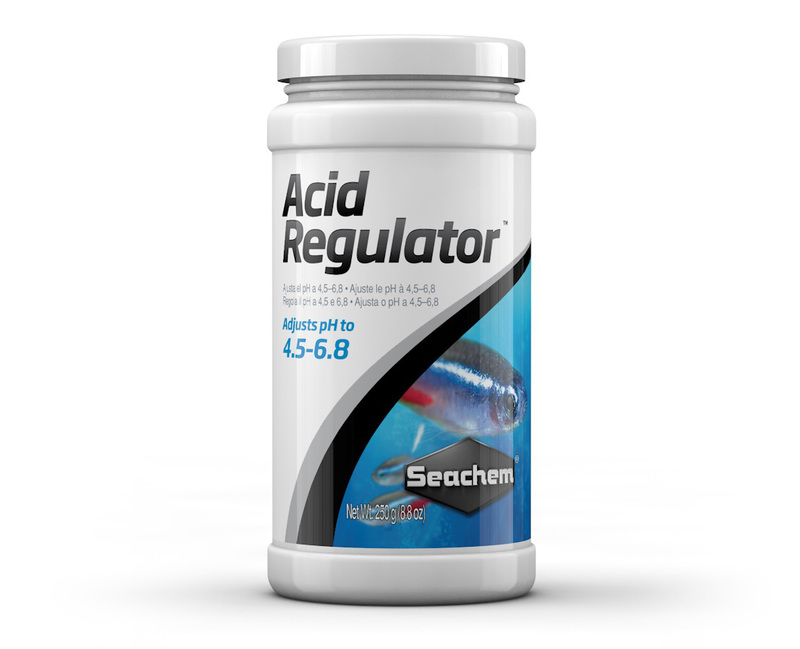 Can I use Acid Regulator™ in a planted aquarium? A: Yes, it won't harm your plants, however, Acid Regulator™ is a phosphate based buffer, so you may experience some unwanted algae growth depending on usage. For lowering pH in the planted aquarium, we recommend Acid Buffer™. Acid Buffer™ is a phosphate/carbonate free buffer for lowering and stabilizing pH in the acid range of pH 4–6.8. A: The difference is that Acid Buffer™ is a straight acid source and Acid Regulator™ is a phosphate based buffering system. Acid Regulator™ has a greater ability to maintain a pH as were a straight acid source can have a slight pH drift. When you are trying to avoid any additional phosphates I would go with the Acid Buffer™ and Alkaline Buffer® products but if that is not an issue, then the Acid Regulator™ will maintain a more constant pH. Can I use Acid Regulator™ alone to keep a pH of 6.8 or so, or do I need to use it with Neutral Regulator®? A: You can use Acid Regulator™ by itself to achieve a pH within the range of 4.5 - 6.8, adding slowly until intended pH is reached. We recommend using Acid Regulator™ in combination with Neutral Regulator® or Alkaline Regulator™ to maintain a slightly higher pH or to increase pH (if your pH is lowered too quickly, etc).